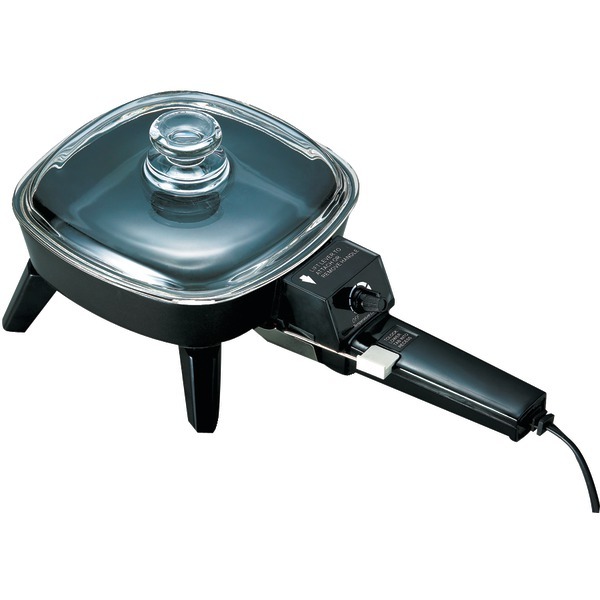 Presto 11" Electric Skillet with high-dome EverNu lid. The EverNu lid is so durable it won't dent warp bend or peel and will accommodate large roasts hams and poultry in virtually warp-proof heavy cast aluminum base. Accurate cooking temperatures are maintained with the Control Master heat control. 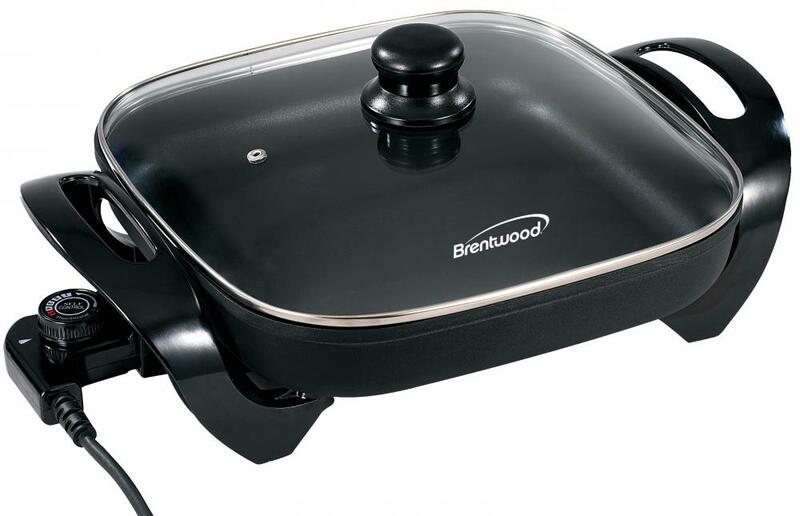 Deluxe nonstick finish inside and out for stick-free cooking and easy cleaning. Skillets are fully immersible and dishwasher safe with the heat control removed. This item cannot be shipped to APO/FPO addresses. Please accept our apologies. 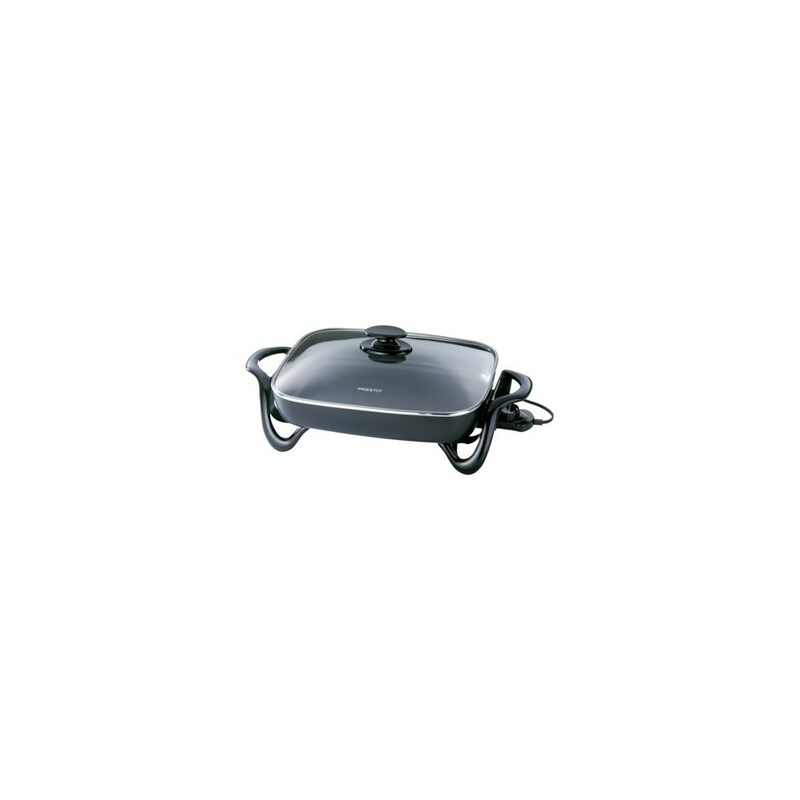 Presto 11" Electric Skillet with glass cover. Roasts fries grills bakes makes casseroles and more. Doubles as a hardy buffet server. 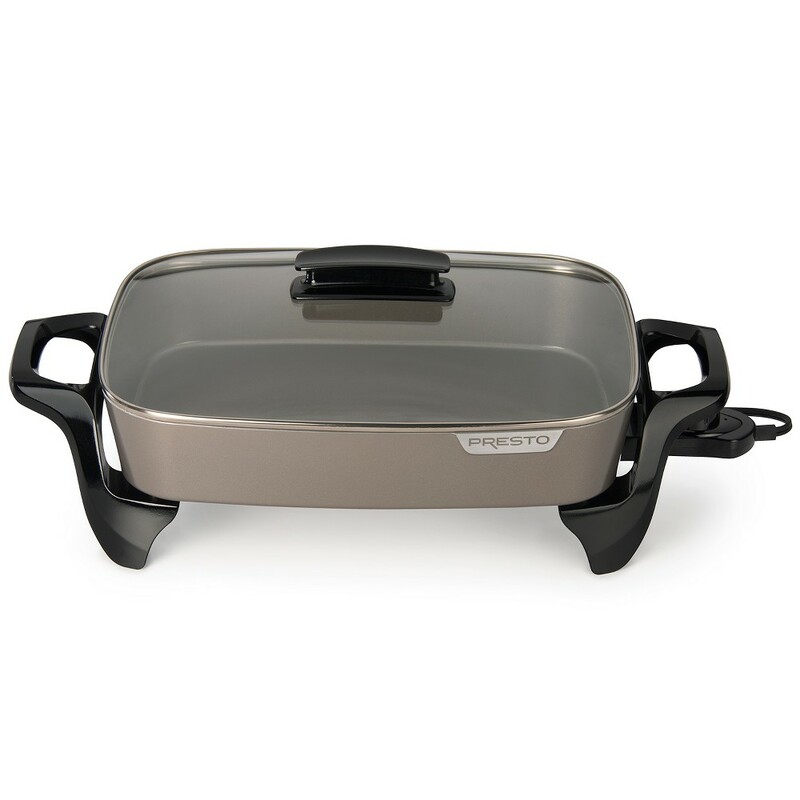 High sidewalls and a tempered glass cover make this skillet ideal for breakfast lunch dinner and entertaining. Heavy cast aluminum base is virtually warp proof. Saves energy - it is more efficient than using a range burner or oven. Fully immersible and dishwasher safe with the heat control removed. 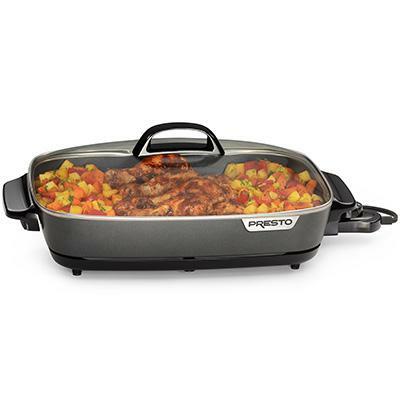 Deluxe nonstick surface inside and out for stick free cooking and easy cleaning. Control Master heat control automatically maintains the desired cooking temperature. This item cannot be shipped to APO/FPO addresses. Please accept our apologies. 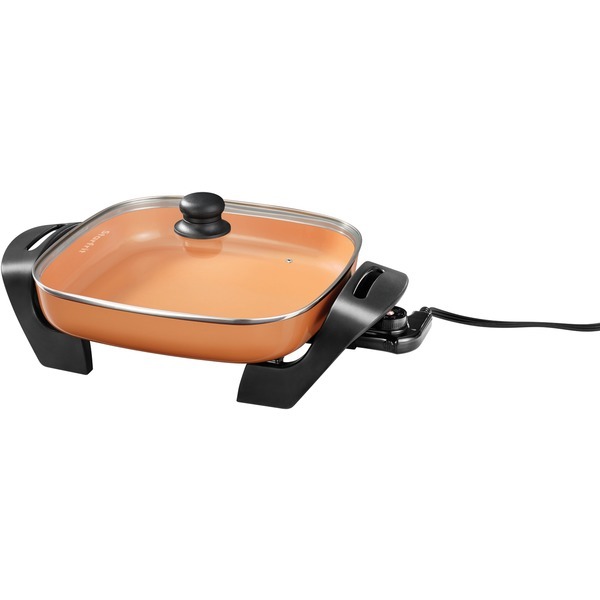 Presto 16" Electric Foldaway Skillet. Roasts fries grills stews bakes and makes one dish meals. Built in pour spout doubles as a spoon rest. Base and handles detach and nest in pan for easy storing. 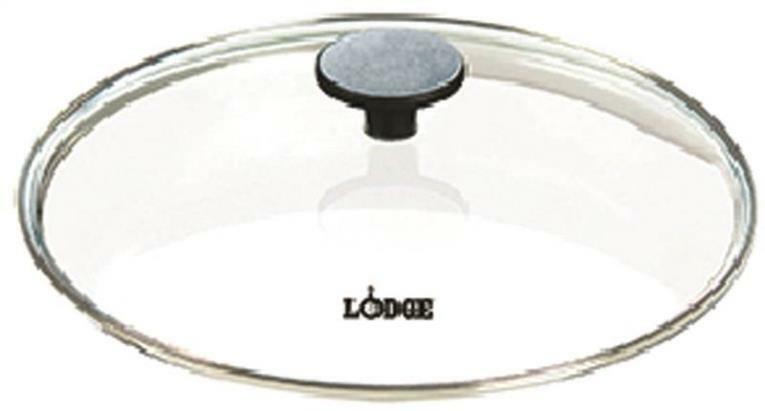 Great for every meal - big 16" base and high sidewalls provide extra cooking and serving capacity. Saves energy because it is more efficient than a range burner or oven. Tempered glass cover and stay cool handles allow skillet to double as a buffet server. 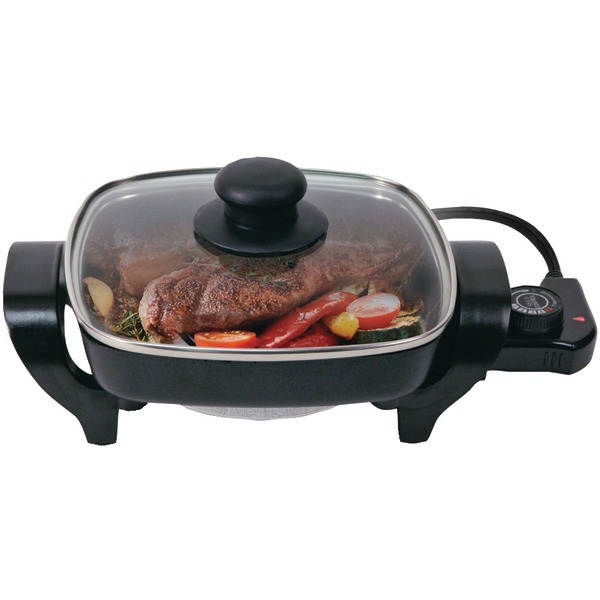 Control Master heat control maintains the desired cooking temperature automatically. Heavy cast aluminum base features a deluxe nonstock surface inside and out. Skillet and cover are dishwasher safe with the heat control removed. Fold down handles to detach skillet pan from base. With handles folded in the base and handles store in skillet for compact storage. This item cannot be shipped to APO/FPO addresses. Please accept our apologies. 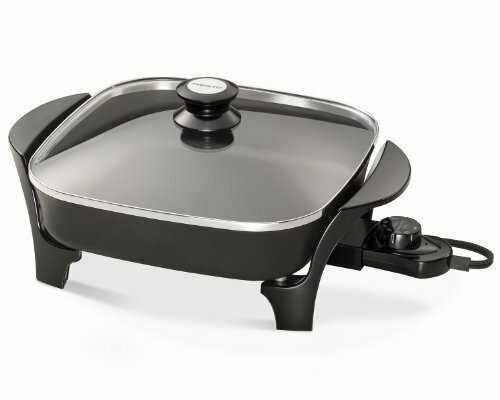 Electric SlimLine Skillet 16" Electric SlimLine Skillet 16"
Presto 16" Electric SlimLine Skillet will supplement your stove top or keep food warm for a buffet with this 16" electric skillet from Presto. 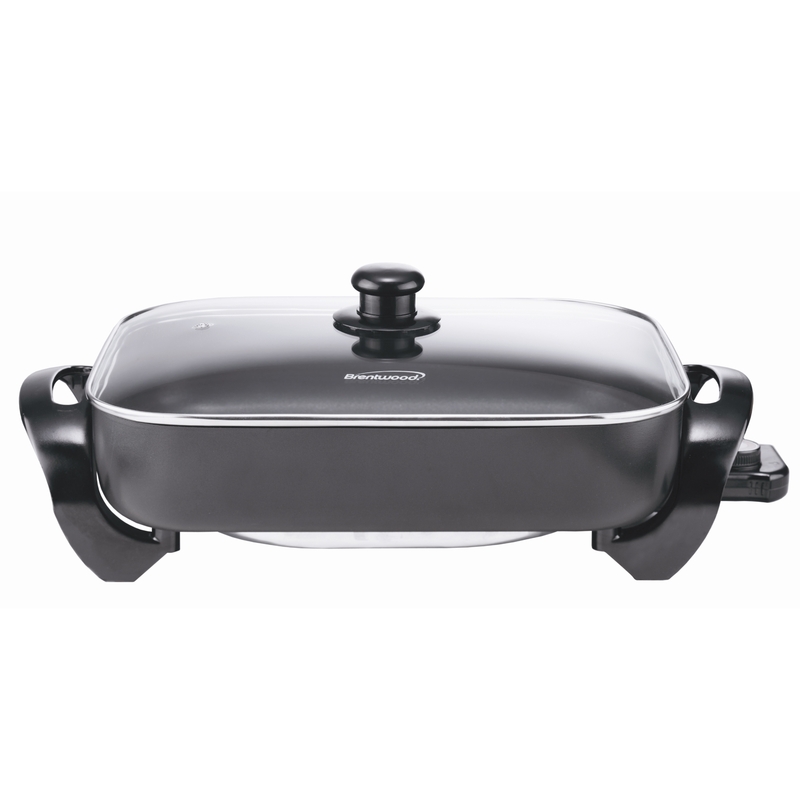 The slimline design features high side walls that give you room to stir as you roast fry or stew your favorite dishes. Cast aluminum base with nonstick surface. Tempered glass lid. Control Master heat unit automatically holds temperature. High sidewalls for low-mess stirring. Fully immersible and dishwasher safe with heat unit removed. Black and Stainless This item cannot be shipped to APO/FPO addresses. Please accept our apologies. 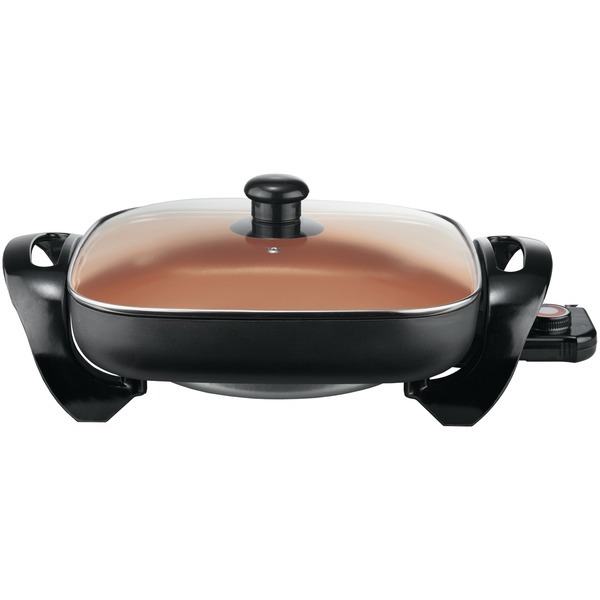 SKILLET/ Accommodates extra large cuts of beef, pork, and poultry with its generous base and high dome cover. Fries, grills, roasts, stews and cooks casseroles. The EverNu™ cover is so durable, it won't dent, warp, bend or peel. Accurate cooking temperatures are maintained with the Control Master� heat control. 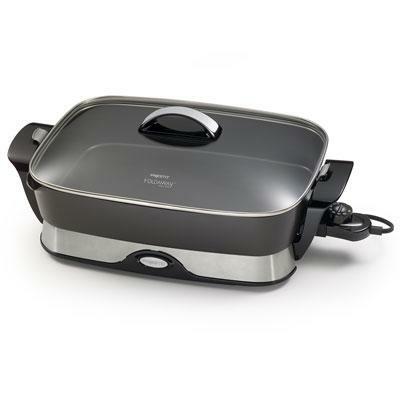 A deluxe nonstick finish, inside and out, provides stick-free cooking and easy cleaning. Skillet is immersible and dishwasher safe with the heat control removed. Roasts, fries, grills, stews, bakes, makes casseroles and one-dish meals. Fully immersible for easy cleaning. Handy for every meal! Great for breakfast, lunch, dinner, and entertaining. Ceramic nonstick surface, inside and out. Jumbo size. 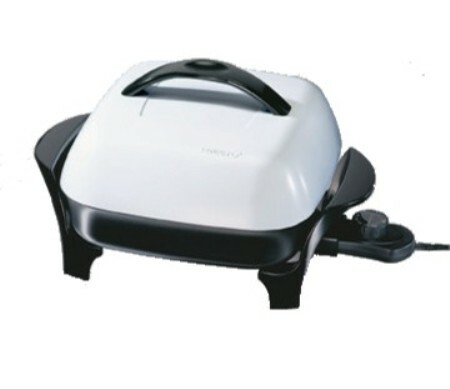 Big 16-inch base and high sidewalls provide extra cooking and serving capacity. Heavy cast aluminum pan is virtually warp-proof. Easy to clean. Fully immersible with the heat control removed. Stay-cool handle and tempered glass cover make it ideal for use as a buffet server. 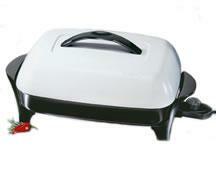 Big 16-inch base and high sidewalls provide extra cooking and serving capacity. Great for breakfast, lunch, dinner, and entertaining. Plus, itG�+s more efficient than a range burner or oven. Tempered glass cover and stay-cool handle allow it to double as a handy buffet server. Heavy cast aluminum base is virtually warp-proof. Deluxe nonstick surface, inside and out, for stick-free cooking and easy cleaning. Saves energy because it is more efficient than using a range burner or oven.